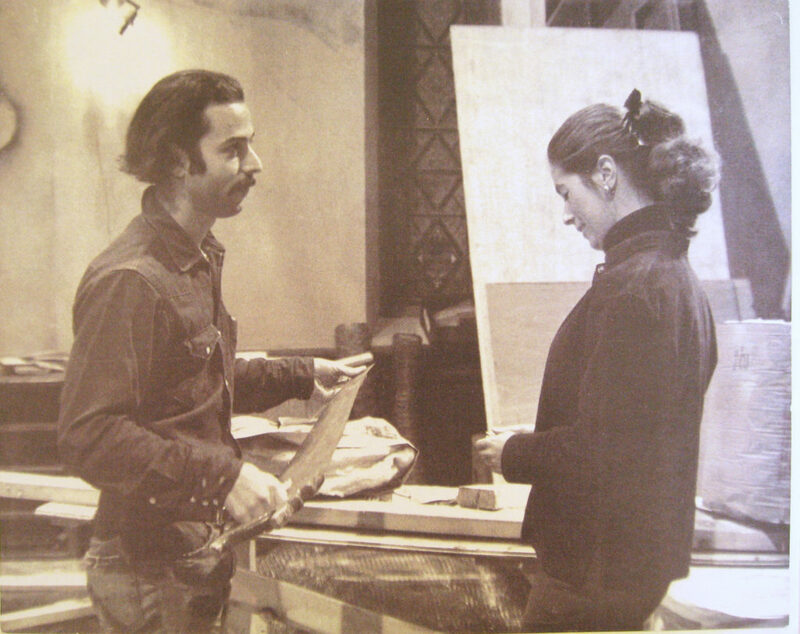 Paul Kleinwald, on the musical saw, and Alice Brock, on the set of Arthur Penn's 'Alice's Restaurant' in 1969, based on the well-known Arlo Guthrie song and album of the same title. Great Barrington — When I was just a lad in knickers Huddie Ledbetter’s (a k a Lead Belly) tune Irene Goodnight was a big hit by the Weavers, of which Pete Seeger was a member. At age 12 I started to attend summer camp where there was singing at meals and around the campfire. One of my counselors liked to sing Good Old Mountain Dew, (version by Stringbean). In my third year at camp I was given a radio by my grandfather which I would turn on under the covers after lights out and listen to the Saturday night “Jamboree” broadcast from Wheeling, West Virginia (sponsored by Mail Pouch Tobacco). I was hooked — on the music, not the tobacco. In high school Arlo Guthrie was my classmate and friend. Arlo already had a little band. Influenced by him I became obsessed with learning the banjo and started out with a $20 4-string banjo. After buying a The Stanley Brothers record at Newberry’s department store in Pittsfield I decided I needed a 5-string banjo. That summer I practiced that banjo between 4 and 8 hours a day. In 11th grade, I became a banjo player in Arlo’s group called the “New Almanac Singers.” We visited Pittsfield for the Berkshire Folk Music Society meetings that were organized by David Grover’s father Hank. At those meetings anyone that wanted to was given a chance to “share” a song or two. One time Arlo and I went to visit with and play for his father, Woody Guthrie, while he was in the hospital. At age 19 I drove to Asheville, North Carolina, for the 38th Mountain Dance and Folk Festival (founded by Bascom Lamar Lunsford who wrote Good Old Mountain Dew. A banjo teacher of mine was at the festival and convinced the organizers to put me on stage to play a couple of Old Time tunes which were The Cumberland Mountain Bear Chase and The Cuckoo. I went on to win many banjo prizes, and to record my own album “From the Hills,” and here’s a song from it, Little Margaret. I was on the journey to study the cultural oral tradition of Americana, or Roots Music. American Roots Music is an acoustic music oral tradition that echoes the story of man and his relation to land and community through words, music, and dance. The music’s origins date back thousands of years in historical traditions still carried on today. “Roots Music” is a nationally identified collection of musical and song styles born of blending the world cultures from the American melting pot. Centuries old Western European music blended with complex African and Middle Eastern rhythms and melded with Scotch, Irish, English, French, German, Scandinavian and other traditions. The connection between American Traditional Music from ancient times and today’s popular music is highlighted in the international recognition awarded to Bob Dylan. Dylan was awarded the Nobel Prize for literature for 2016, giving Roots Music modern history’s highest recognition. He was influenced directly by the work of folk singer and Roots musician Woody Guthrie who traveled across America writing, singing, and illustrating people’s stories of struggle and joy. In Dylan’s “The Cuckoo is a Pretty Bird” (see video below), you can hear the direct links to his early Roots Tradition influences. Dylan sang, composed, and wrote outside of Academia and broke even the bounds of the contemporary popular music of his day. As Dylan’s literature was influenced by Guthrie, Guthrie was influenced by the Common People’s music that stretches back hand to hand for at least a thousand years. The most commonly recognized forms of Roots Music might be loosely classified as “Folk Music” or music of the people. American Roots Musical styles also include Blues, Jazz, Old Time String Band, Bluegrass, Cajun and Square, Step and Contra Dancing among others. Many tunes have lyrics that speak of social order, morality, history, romance, labor, finance, tragedy and high expectations. For the most part these musical styles are not a part of the mainstream television and radio broadcast entertainment. They persist through direct interpersonal transfer in private homes, small concerts, and even Carnegie Hall. With the advent of the Internet American Roots Music has become available worldwide through small personal websites, Vimeo, and YouTube where the earliest audio recordings to the most contemporary videos are available. This in part may explain the resurgence of the American Roots Music tradition, which can be found in a myriad of live music venues, bars, concerts, fairs, and festivals throughout the U.S.
Like European Early music traditions melodies were repeated with different lyrics that had regional, historical or contemporary significance to the audiences they were performed for. The same is true of some American Roots compositions. The nationally known song “When Johnny Comes Marching Home Again” was adapted from an earlier Irish song. The first known American folk song, “Brave Wolf,” relates the battle of Quebec during the French and Indian Wars. Even the modest mid-18th century Massachusetts tragic song “Springfield Mountain” found its way gradually modifying over 150 years into the American Mid-West as a humorous children’s song that still managed to carry the original message of warning to be careful while cutting hay in the field. As they arrived in North America early settlers gradually moved west taking their music traditions with them to isolated communities. As the oral tradition spread many of the songs and dances kept their original forms, while many changed to suit new circumstances, community needs, and personal creative desires. The 18th century travelers and storytellers brought their homespun music and topical songs to town and country people eager for news and celebrations with dance and song. Today’s American Roots troubadours continue to perform ancient and modern compositions. Single performers to 8-piece bands ply their skills on guitars, banjos, mandolins, violins, bass fiddles, accordions, washboards, and even tubas in complex ornamentation or simplistic haunting melodies. Traditional “picking parties”, fiddle contests, and music festivals are the core of the contemporary American Roots Music community, where music is learned by ear, memorized, and shared. People come for days to camp at multi-day festivals not only to hear performances but to practice their own skills with old friends and strangers in impromptu music sessions sometimes as good as the scheduled stage professional performers. One of the most enchanting experiences at a Roots Music Festival, (like the Oldtone Roots Music Festival in Hillsdale, N.Y.), is to wander around the campground after the performances are over. One can follow the sound of fiddles, banjos, bass fiddles, or harmonized voices to find a jam; festival attendees and headline performers alike, playing and singing. This is the way the music has been passed from friend to friend, parent to child, for hundreds of years. At the end of the song, the players pause, and the person who started the song will say; “I learned that from . . . “, and someone else will say, “ . . . does a version of it”, or “I learned this variation of it at . . .” Silence will fall, or soft comments and laughter. Then someone will play a few notes, and one by one the musicians will join in on a new song. The watchers will stay for another song, or wander off, drawn by a voice or chord from another jam. Smithsonian Folkways is the nonprofit record label of the Smithsonian Institution. Founded by Moses Asch, the Folkways label is dedicated to recording and preserving and dissemination the “people’s” music. Archival recordings are always available. But for live experience locally you can check out Oldtone Productions Music Sessions monthly at Dewey Hall in Sheffield, or attend the annual Oldtone Roots Music Festival in Hillsdale, New York. Great article! It leaves the reader with a smile whether they have experienced any of the author’s points or not. “From the Hills” is a great album, especially Paul’s version of “Little Margaret,” my favorite. Kudos and thanks! Enjoyed this article! Inspired me to dig around in my Lomax “Folksongs of North America” volume again. Such a treasure trove of material and, Paul’s story reinforces that this music is very much alive. Thanks!